Discovered in 1882 during excavations, the giant statue of Pharaoh Ramses II was cut into six pieces in the 1950s and moved to Ramses Square in central Cairo where it stood for a further 50 years. 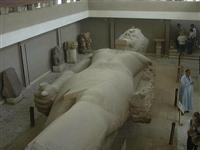 In 2006 the statue moved to a new, temporary museum a few miles outside of Cairo, as there were growing concerns that heavy pollution was damaging the 3,200-year-old statue, which weighs 83 ton and stands 36 feet (11 metres) high. The moving of the massive statue was a technological challenge and has been covered in a documentary by National Geographic. Ramses II, who ruled Egypt for more than 60 years during the 19th dynasty of pharaohs, was one of ancient Egypt's most prolific builders and there are a number of statues of him remaining in Egypt. However, none are as impressive as the colossus. All in all, the statue is beautifully preserved although one side is discernibly less perfect as it was exposed to the elements for centuries before its re-discovery in 1882. The expression on his face is serene and quite enthralling. The famous statue was moved for the final time in January 2018. It now takes pride of place in the entrance hall of the Grand Egyptian Museum. This 650,000-square-foot museum is currently under construction and will have capacity for up to 100,000 artefacts upon completion in 2020.